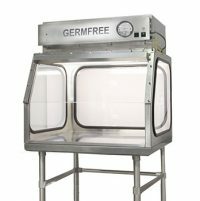 Germfree’s Compounding Safety Enclosures (CSE) provide the operator with maximum protection while weighing and transferring non-sterile powders and compounds. The CSE’s filtration system handles particulate laden air and directs it away from the user. Large hinged windows provide ample clearance for equipment entry. The stainless steel surfaces inside the hood are impervious to most chemicals and are easily cleaned.